There’s never a dull moment on the incredible John Kerwin Kids’ Show! It brings a whole lot of laughter, tons of joy and an endless amount of excitement, the John Kerwin Kids’ Show is The Tonight Show for kids and the remarkable host of the show, Mr. John Kerwin himself, makes each and every episode so unforgettable for the kids, their parents, and the amazing, celebrity guests. In every episode, John Kerwin brings together many of our favorite celebrities – from Nickelodeon stars to Disney stars and beyond! In the recent episode that taped on September 19, 2017, outstanding celebrity guests including Lilimar, Aidan Miner, Diego Velazquez and Ricardo Hurtado joined in on all the fun! The sensational Lilimar had a blast on the John Kerwin Kids’ Show talking all about her new Nickelodeon show, Knight Squad. She even battled it out with John Kerwin with a fun sword fight – who do you think won?! She also brought some awesome girl power vibes to the show and posed with a fantastic shield and sword. You go, Lilimar – slay!! Rocking a terrific Pikachu shirt to the show, the magnificent Aidan Miner had an excellent time chatting it up with the one and only, John Kerwin. He even played a spectacular piece on the keyboards. He shared the incredible pictures as seen below on his Instagram account. Looking oh, so stylish, the remarkable Ricardo Hurtado had his guitar in hand and enjoyed his time on the John Kerwin Kids’ Show. It was a hectic week for Ricardo as him and his School of Rock cast-mates also just recently attend the 2017 Creative Arts Emmys, where they were nominated for the second year in a row. The spectacular Diego Velazquez had a magnificent time on the show. 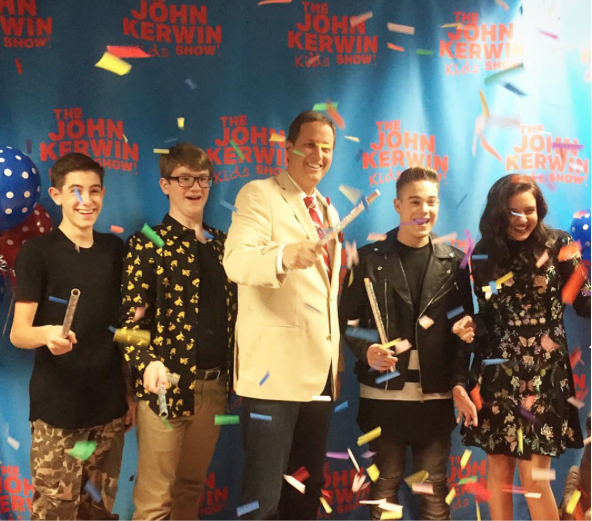 The Thundermans star had a blast and enjoyed throwing some confetti in the air backstage to celebrate another brilliant taping of the John Kerwin Kids’ Show. Diego Velazquez shared an amazing group picture of himself with John Kerwin, Lilimar, Ricardo Hurtado, and Aidan Miner as seen below on his Instagram account. The John Kerwin Kids’ Show is one talk show that never fails to put the biggest smile on your face. John Kerwin has such a wonderful flair for interviewing and he has such a great rapport with all of his guests. This past episode was absolutely extraordinary and we always look forward to seeing what other marvelous things are in store in future episodes of the stellar show. I, Alexisjoyvipaccess had another fabulous time covering the John Kerwin Kids’ Show again. The John Kerwin Kids’ Show brings out such positive vibes and you can feel the genuine fun and happiness that all of the kids experience at the show. There’s nothing quite like seeing all of the kids’ faces and their smiles from ear to ear whenever they’re at the John Kerwin Kids’ Show. Check out some more pictures below from my coverage of the most recent episode taping of the John Kerwin Kids’ Show! Previous VIPAccessEXCLUSIVE: The Remarkable Ask Jonesy & Company Interview With Alexisjoyvipaccess At Their Concert At The Chain Reaction In Anaheim! Next VIPAccessEXCLUSIVE: UniCon Celebrated All Of The Amazing Moms With Beauty, Fashion And Fun Activities At The Sofitel Hotel In Los Angeles 9/23!